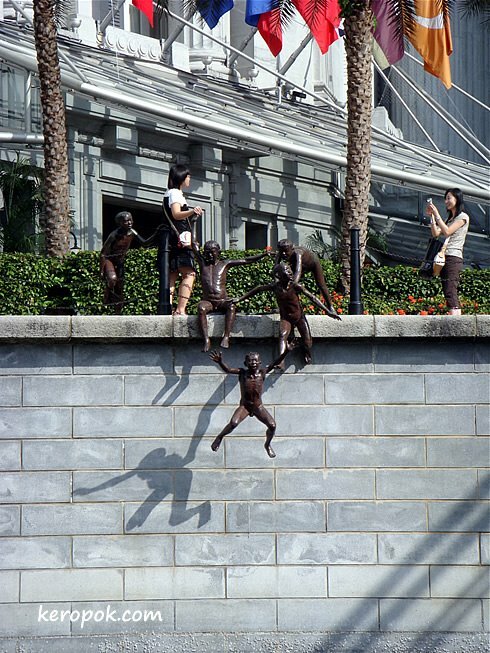 This sculpture of kids jumping into the Singapore River is known as "First Generation". I think most people who have visited Singapore and have walked along the Singapore River near the Fullerton Hotel has taken a shot of this. love the composition with the girls photographing each other oblivious to sculpture - it is the kind of composition I look out to try and capture but haven't succeeded as yet. A really fun sculpture. Nice shot with the young women & the shadows. That is a very cool sculpture! All around amazing image. Very well done. Great sculpture, you've captured it really well. How is the child suspended in the air?